For each of these major Airports, I’ll put up the graph, the average of the data, the difference between the Airport data item and the average, in both F and C. Two graphs will be given for each. One that is “all data” not filtered for High and Low (though on one I tossed a duplicate that was identical on all terms including location and time of datum) and the next having the Highest and Lowest value tossed out (or sometimes 2 or more if they had a tie for a value). These are graphed with a gap in the chart on the missing data item so that the graphs can be visually easily compared. Remember that the very first data point on the left will be the airport itself. To me, with this added group of charts, it’s pretty darned clear that these large airports are not at all representative of their locations and are consistently on the hot side. This data was gathered in the dead of night, so while not an absolute “coldest” are from what ought to be a ‘cold and cooling’ time for that station and nearby stations. It looks to me like Airports just don’t cool down very fast and have a couple of degrees lag. 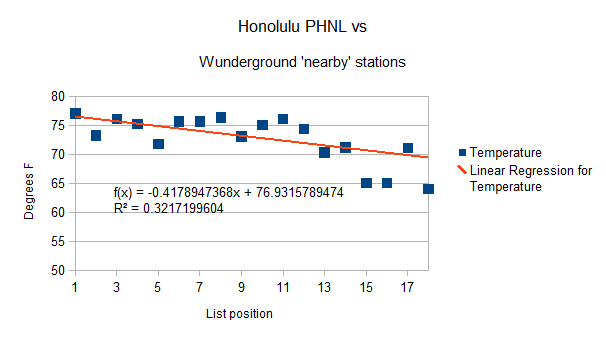 (I have looked at the nearby station during the daytime and while it is a bit warmer, it isn’t as big a difference. Clearly a day / night comparison set needs to be done too. The same stations compared at 3 PM and 3 AM (or some similar standardized time) to see if there is a consistent pattern; such as both warms and cools more slowly, or warms faster and further then stays hot higher and longer. My first instinct is that solar heating will be more effective but on cloudy / rainy days there will be little difference to the hot side. Cooling at night to lag due to thermal mass of concrete and asphalt, but not when it snows or perhaps even in heavy rain. That’s the working thesis at any rate. 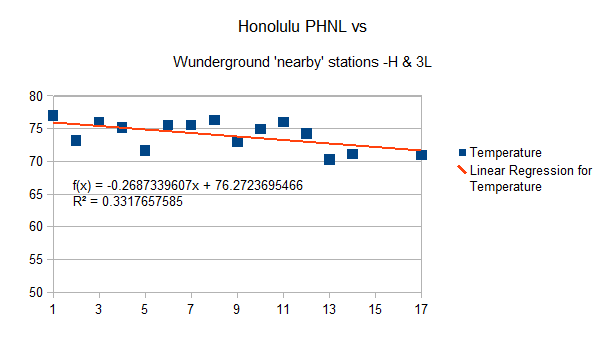 What we see in these graphs is just that the airports are hotter than their ‘nearby’ reporting stations and that difference tends to increase as you move down the Wunderground list (though not always). This one is a very large difference. If there is a solar heating component, that would tend to show up more in the tropics. Then again, in Hawaii, temperatures don’t change much… so I’m really wondering why the Airport is so hot. IIRC, this was where WUWT found a broken sensor that was not replaced for a long time. Once can only wonder if they are having more sensor problems; or if the new sensor is just in a very hot place surrounded by concrete and tarmac. Why take out the three lowest temperatures? 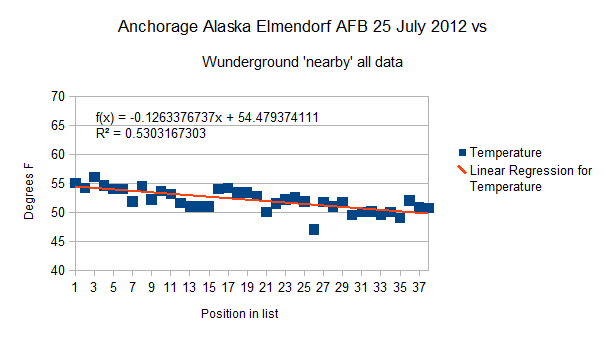 They were all fairly low and at fairly high altitudes, so unlikely to be an accurate comparison to a nearly sea level airport. There are other data points in the set of data that are at some altitude, so perhaps an altitude adjustment could be made to find out bias minus adiabatic lapse rate. (Data blocks at the end down below). 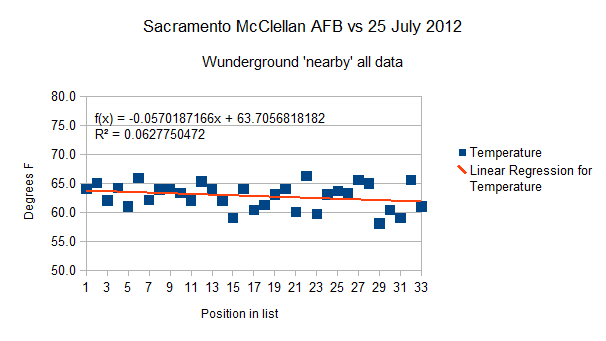 Sacramento in July is often over 90 F and often stays in the 80 F range into the night. I grew up about 70 miles north of Sacramento and temperatures in the 60 F range at night in summer is fairly rare. It can happen, especially down near Sacramento when the winds start up off the San Franciso Bay / Delta waters. It has been fairly overcast and cloudy here a lot lately (rather like it was back in the 1950s) but that ought not to change the relative positions of the airport vs nearby too much (other than flattening the trend compared to solar heated tarmac a bit). Still, a closer look at Sacramento on a clear hot sunny day and night would be in order. keep scattered showers and thunderstorms going over the Four Corners region. nighttime temperatures will only fall into the mid-70s. This entry was posted in AGW Science and Background and tagged AFB, Airport, Airport Heat Island, Alaska, Anchorage, Global Warming. Bookmark the permalink. On Wunderground you can click on a “select station’ button up near the top when looking at any particular station and it will make a map with the first 10 choices on it. They look to me like they are the same stations as in the list lower down of ‘nearby’ stations. Inspection of those maps looks like Wunderground does a ‘sort of a spiral out’ method. The further you get from the large airport and all the urban growth that is nearby, the cooler your general temperatures become. Another mystery solved. Cats love to nap on large rocks, even if they are well buried and not tall. Cats have a body temperature of 101.5F and love warmth. Large rocks are excellent solar energy collectors, with large heat storage as well. The cats know! Out in fields, large rocks melt the snow off of themselves before the ground clears. I doubt that, Warmistas hate warmth and wish it cold. …Large rocks are excellent solar energy collectors, with large heat storage as well. The cats know! Out in fields, large rocks melt the snow off of themselves before the ground clears…. Anyone who has had to shovel a driveway up north and is a bit lazy knows the simplest way to get it clear down to the pavement is to clear off most of the snow and then dig to bare pavement in a few patches and the sun will do the rest of the clearing for you. Not airports direct but seen this? RE….“in Hawaii, temperatures don’t change much“…..
___is very close to a sea area, where presumably enormous naval activities during and after WWII took place, that can have changed the ‘sea-surface structure’ in more than one way, e.g. the sea of Obs is fairly deep, with much colder water just below the sea surface, or: the day time warming of the sea surface was quickly replace by colder (not sun warmed) water. ___the extraordinary drop from 1945 to 1949, coincides with size of the US Navy at Honolulu. ___It would be too easy to assume a malfunction of the measurements, although not totally impossible, but that would objectively mean that the people running the Obs must have been completely ignorant and incompetent not to recognising it. ___which would be particularly helpful in the climatic change debate, and even more, if naval activities caused the air temperature to drop dramatically „Honolulu Obs Oahu“ from 1945 to 1949.
and Anthony Watts (http://wattsupwiththat.com/2012/07/29/press-release-2/ ) doing similar things and coming to very similar conclusions. 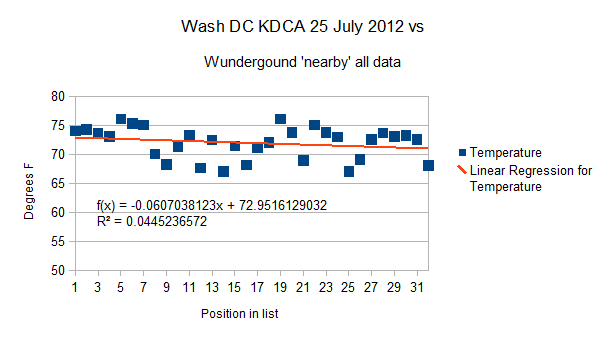 It looks like even the raw data from a lot of urban and airports sites is suspect. Just because there are ‘scientists’ in NOAA doesn’t mean they (aka ‘We’) have the cream of the crop, nor that they (‘We’) have those with the highest integrity. Goberment ‘scientists’ are as suseptable to pressure as everything and everyone else in the Universe is. One rotten apple will spoil the bunch, and a bunch of rotten apples will spoil a heck of a lot more than apples. Interesting point… NOT living where it snows, I only get to see such things when visiting ‘snow country’. I remember seeing such patches of melt spreading, but hadn’t made the connection to ‘climate stuff’ now… Thanks for making the connection. An interesting conundrum… I don’t have much to add in the way of clarity. About all I can do is point out some “issues”. Change from buckets to engine intake. (And a potential change of depth of water measured). Airport data being biased high. Potential for deep draft ships to stir cold water to near the surface (as all those carriers and battle ships headed home). And the potential for ‘regime change’ in ocean currents in the mid Pacific. Suspect? I don’t think it is “suspect”, I think it is clearly broken. ANY data from an airport or from an urban jungle is measuring the thermal mass of concrete, tarmac, and cars and the heat dump of megaWatts of electricity and tons of fossil fuel burn. I suspect it is even worse than that. We have folks with a clear bias and political agenda in charge of the hiring… Hansen has testified that it is OK to break the law if you believe you are doing it for a ‘greater good’ (and the nutty UK courts bought that… setting a precedent…) and has gotten himself arrested in showing off his Green Credentials. Others in the AGW movement are just as rabid. It is a cultural bias that will pervade their organizations. So it isn’t just ANY ‘rotten apple’, it tends to be the top dogs that are the ‘rotten apples’; and they will have strong and direct influence on the entirety of what forms below them.